A granite countertop is a perfect choice for your kitchen, bath, bar or outdoor kitchen. While granite, marble, limestone, travertine, slate and soapstone are all beautiful, some are better suited than others for a particular use. You can choose your granite from here. Please contact us for more choice. Marble can be used in many different projects including foyers, floor tiles, bathroom wall tiles, vanities, fireplaces, columns, steps and many others surfaces. Marble is softer and more porous than granite making it less practical for rigorous kitchen use. 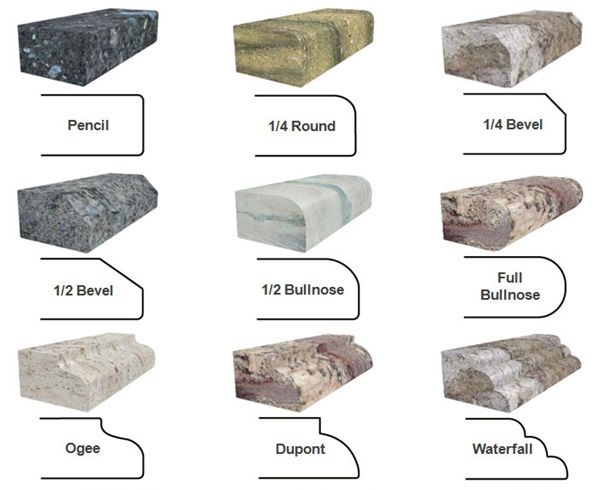 You can choose your marble from here. Please contact us for more choice. Please click here for Quartz Polarstone with wide range of selections. Say yes to marble design in the kitchen. No other countertop surface on the market combines perfected marble designs with the durability of quartz surfacing. Inspired by timeless Italian marble and created with innovative engineering, Polarstone meets the highest manufacturing and design standards in the industry. This advanced quartz surface is heat, scratch and chip resistant. It is non-porous, non-absorbent and will not harbor bacteria. No sealant is required to maintain the beauty and durability, which makes Polarstone ideal for food prep and for those who love to cook. A lifetime of original beauty can be simply maintained with mild soap and water. Your Polarstone quartz surface is backed by a 15 year limited warranty, giving peace of mind for a product that will provide a lifetime of beauty. Discover the warmth and richness that can only be found in natural quartz surfaces where elegance and beauty meet function and lasting durability. You can choose your Cambria from here. Please contact us for more choice. You can choose your Silestone from here. Please contact us for more choice. You can choose your MSI Quartz from here. Please contact us for more choice. Comprised of 93% natural quartz, Caesarstone Quartz Surfaces and Countertops offer the ultimate combination of form and function, allowing for a more diverse, durable, and practical countertop surfacing material than either granite or marble. You can choose your Caesarstone from here. Please contact us for more choice. DuPont™ Zodiaq® is 93% pure quartz crystal, which gives Zodiaq® a natural depth and radiance without the imperfections common in unimproved stone. Zodiaq® is incredibly durable and resists both heat and scratches. You can choose your DuPont™ Zodiaq® from here. Please contact us for more choice. Homeowners who want an exquisite and exclusive product in their home, are choosing soapstone countertops over granite and other surfaces. Soapstone (also known as steatite or soaprock) is a talc-schist, which is a type of metamorphic rock. You can choose your Soapstone from here. Please contact us for more choice. VICOSTONE quartz based engineered stones are produced from up to 93% pure natural quartz aggregates which are adhered with a polymer resin with color powder, and have a hardness and flexural strength which is much higher than natural stones and other engineered stones. With a special and luxurious beauty, VICOSTONE compound stones are widely used in interior applications such as kitchen countertops, bathroom vanities, wall paneling, and flooring. You can choose your Vicostone from here. Please contact us for more choice. Rare and translucent, onyx is a luxurious focal point that catches light and seems to glow from within. You can choose your Onyx from here. Please contact us for more choice. Vetrazzo® is a recycled glass surface comprised of 100% recycled glass. When you buy Vetrazzo, you get an exquisite surface material—truly a work of art—that becomes the centerpiece for your home or project. We would like to inform that Vetrazzo Countertops are within high-end pricing range. You can choose your Vetrazzo from here. Please contact us for more choice. Dakota™ offers a wide selection of unique kitchen and bathroom accessories, including stainless steel sinks, vessel sinks, faucets, showers, vanities and bathroom accessories, you will find a choice for builders, designers and homeowners. Our products are functional, comfortable and versatile with a clean finish. This makes your life in the kitchen and bathroom a more enjoyable one. With Dakota™ you get it all. You can choose your sink from here. Please contact us for more choice. Please be advised that TGM do not install Cast Iron and Farmhouse sinks. Customer is supposed to install and make to ready before TGM`s final measurement. Please give us a call for your further questions. Allora USA is a privately held manufacturer of custom sinks and faucets. Allora uses the best materials and workmanship in every product they offer. They are committed to providing the highest level of professionalism and customer service. They strive to achieve a long term relationship with their clients by delivering high-quality and cost-effective products. You can choose your faucet from here. Please contact us for more choice. You can choose your tile from here. Please contact us for more choice.